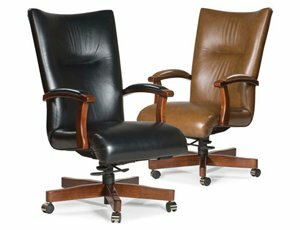 If you’re searching for executive chairs for your office in Alpharetta, Woodstock, Sandy Springs, or any other nearby community in the Atlanta, GA, area, visit NorthPoint Office Furniture. At our showroom located in Roswell, Georgia, you’ll be able to see the massive selection of chairs we carry. We have full displays that we’ve set up to help you visualize how our furniture will look in an office setting, and to help you make decisions about specific colors and styles. And, with chairs from reputable manufacturers such as HON, Fairfield, La-Z-Boy Contract, and more, you can rest assured that regardless of the chair you choose, you’ll receive a reliable and durable product. When it comes to looking for executive chairs, it’s important to make sure the executive chair you purchase matches the décor and aesthetics of your office. We have designs that range from the traditional wood and leather look, to modern ergonomic chairs with mesh backs. Plus, you’ll be able to select chairs with various features, including adjustable arms, headrests, lumbar supports, recline capabilities, and more. In addition to executive chairs, at NorthPoint Office Furniture we offer a wide array of other office furniture. We carry everything an office may need, from meeting and conference tables to filing cabinets and bookcases. To learn more about the executive office chairs and other office furniture we sell, contact us today. We proudly serve businesses in Alpharetta, Woodstock, Sandy Springs, and all other nearby Atlanta, GA, areas.